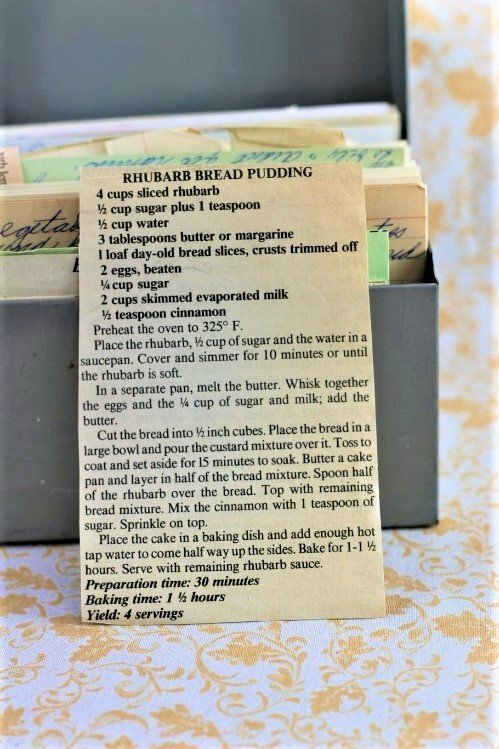 Front of the recipe card for Rhubarb Bread Pudding. 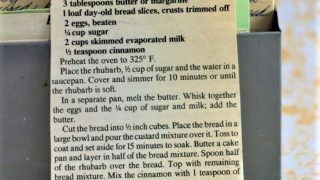 There are lots of fun recipes to read in the box this recipe for Rhubarb Bread Pudding was with. Use the links below to view other recipes similar to this Rhubarb Bread Pudding recipe. If you make this Rhubarb Bread Pudding recipe, please share your photos and comments below! Place the rhubarb, ½ cup of sugar and the water in a saucepan. Cover and simmer for 10 minutes or until the rhubarb is soft. In a separate pan, melt the butter. Whisk together the eggs and the ¼ cup of sugar and milk; add the butter. Cut the bread into ½ inch cubes. Place the bread in a large bowl and pour the custard mixture over it. Toss to coat and set aside for 15 minutes to soak. Butter a cake pan and layer in half of the bread mixture. Spoon half of the rhubarb over the bread. Top with remaining bread mixture. Mix the cinnamon with 1 teaspoon of sugar. Place the cake in a baking dish and add enough hot tap water to come half way up the sides. Serve with remaining rhubarb sauce.